Ding Dongs were my favorite Hostess treat. Seemingly the same chocolate coating, chocolate cake and creamy filling as the tube shaped HoHos yet so much better. I always blamed it on the virtues of the foil wrapper over the sealed plasticky wrap of the HoHo. 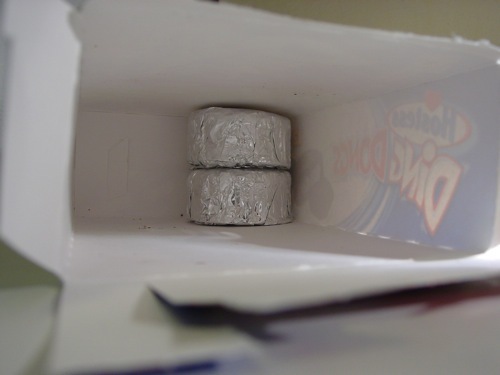 But then Hostess changed the wrap on the Ding Dong to the same less desirable plasticky wrap yet the Ding Dong was still superior. Must be the shape. Or ingredients? I ate a bunch of them as a kid. Last week I decided I needed a box – I’m an adult, I can buy what I want. Opening the box I was treated with shiny foil wrappings. Best box of Ding Dongs since childhood. Why the switch back? And when? The wrappers make the treat. A sealed plasticky wrap looks like a bag surrounding the treat. There is no definition. Foil tightly wrapped around the fat pancake of a treat just give it more character. And tastiness, I swear. Also, Chocolicious, which seem to be discontinued or at least absent from the Hostess website, were a close second as far as favorites go. Also also, eat them frozen. So good. now I want Hostess stuff. HoHos are better than ding dongs, always have been. Chocolicious were great too. As are Cupcakes…the little swirls on the top make those great.